You are hired by Northwind as a Database administrator. You are required to integrate some Database script solutions into their existing database (Northwind) to modify data from within the database. Provide a SELECT statement to show that the data was inserted. Add the following products for your new Fast-Food category. In an attempt to liquidate some products, provide a script to set all products in the Confections category that have more than 50 units in stock to a price of $10, and disable them. 2 records should be affected. Change the discount in the Order Details table on all orders of products of an ordered quantity of more than 50 to that of the largest discount ever given on any product. You have decided against the new Fast-Food category. 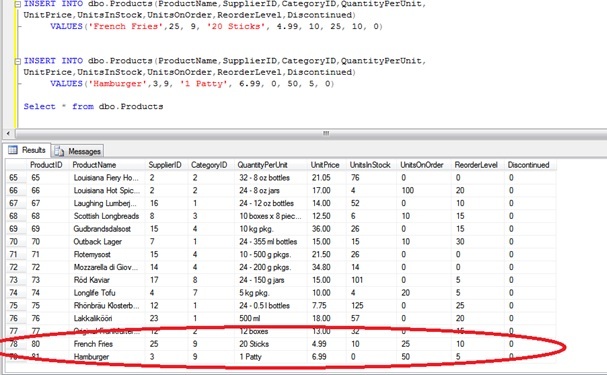 Provide a SQL statement to delete the Fast-Food category as well as any products assigned to that category.